The Cyanoaerling is a weather-based lifeform. It resembles a woody lifeform with five legs. Its skin is well-polished, smooth to the touch. Twisted tips are its feet. Some individuals will have more than five forelegs or hind legs. One limb would split into two separate feet. 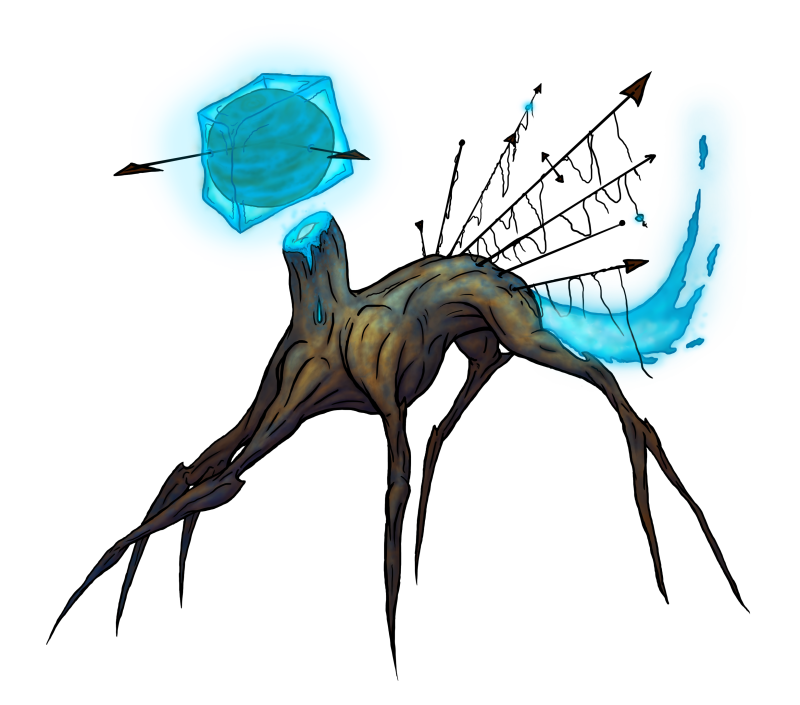 Above its neck stump is a blue cube which levitates one or two feet off the neck pulses lightly with a blue glow. 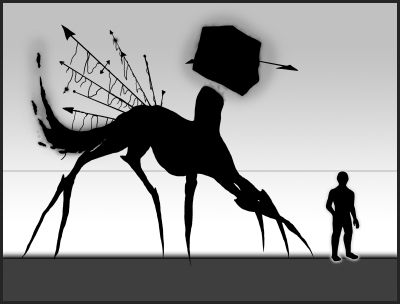 Protruding out of its body and head are black stakes with an arrow on each tip. Threads dangle on some of these protrusions. Attached to the Borderling's rump is a tail that radiates intense energy. Inside the Cyanoaerling is a light-blue liquid that changes into gelatin or gas. If its head gets damaged in any way, the liquid will harden to replace it. If its tail begins to burn out, the liquid will evaporate to fuel its tail. Its temperature fluctuates when changing consistencies. The substance becomes hot as a gas and cool when solid. Its odor is similar to the refreshing scent of morning rain. An impure Cyanoaerling doesn't have enough substance inside its body to survive. It will die after a short while on Earth's dimension. The Cyanoaerling appears anywhere on Earth and doesn't have a preferred location to visit. It's an uncommon Borderling to spot and Witnesses don't see it often. It travels to and from our dimension as a light blue mist. The mist takes the form of the Borderling in a few minutes. The Cyanoaerling is careful with its surroundings. It walks with slow and tedious strides as it wanders the Earth's dimension. With the cube that hovers above its neck, it generates a map of the entire globe. The Borderling uses this map to find and locate weather patterns. It will teleport to that area once it finds a spot to settle. When stationary, it manipulates the weather in its Effect Radius. The Cyanoaerling will remain stationary until the weather changes. It will begin to wander once more. The Cyanoaerling is a solitary Borderling. Its always on the move, looking for satisfactory weather patterns. Despite its frail appearance, it can endure harsh weather while wandering on Earth. If a Cyanoaerling finds another Borderling of the same species, they both immediately stop moving. Like towering statures, they remain immobile until the other moves in the other direction. While they're in that state, the maps in their cubes exchange information to one another. The process ceases after they depart. A Witness will see the change of weather in an 8-mile radius around the Cyanoaerling. They will see rain or snow around the Borderling on a sunny day. In the presence of the Cyanoaerling, satellites will malfunction, giving incorrect or missing data to weather forecasting devices. If the news is displaying incorrect info of the weather, a Cyanoaerling may be present.